Republicans had been hesitant to accept President Obama's invitation to participate in Thursday's White House health-care summit. Their hesitance turned out to be justified. An equal number of Democratic and Republican legislators assembled around the table....But members of the opposition party may not have fully understood that they were stepping into Prof. Obama's classroom, and that they were to be treated like his undisciplined pupils. "Let me just make this point, John," the president said when the tirade ended. "We're not campaigning anymore. The election's over." Teacher directed student to drop the "talking points" and "focus on the issues of how we actually get a bill done." The forum matched his lawyerly skills -- and, less flatteringly, his tendency to act like the smartest guy in the room. Prof. Obama ventured deep into the weeds of health-care policy to contest Republican claims, and, for one day at least, he regained control of the fractious student body that is the Congress. After several such moments, Senate Minority Leader Mitch McConnell ((R-Ky.) spoke up. "Republicans have used 24 minutes; the Democrats, 52 minutes," he said. Obama made McConnell look small in his chair. "You're right, there was an imbalance on the opening statements," he said, "because I'm the president." Doesn’t Obama look small in this exchange? We don’t have to be fair, because I won the election, ha ha ha. Obama pulled the same "I won" rank on McCain. 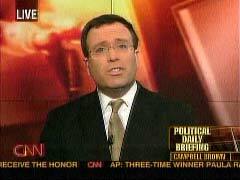 Milbank also looked small in suggesting the public really didn’t have the attention span for a discussion like this, so maybe it wasn’t that awful for the Republicans after all: "The forum probably didn't alter the trajectory of health-care legislation, if only because few Americans could possibly have paid attention." Spotting a huge stack of papers in front of House Minority Whip Eric Cantor (R-Va.), Obama preempted him: "Let me guess: That's the 2,400-page health-care bill." It was. "These are the kind of political things we do that prevent us from actually having a conversation," the president said. House Minority Leader John Boehner (R-Ohio), in his turn, tried all the Republican buzzwords: "scrap this bill ... bankrupt our country ... dangerous experiment ... government takeover of health care ... new taxes ... Medicare cuts ... unconstitutional." Obama shook his head. "John," he scolded, "every so often, we have a pretty good conversation trying to get on some specifics, and then we go back to, you know, the standard talking points." It was the Blair House equivalent of being ordered to wear the dunce cap. Just above Milbank's editorial on the front page, the Post plugged other liberal columnists, such as this headline: "Stephen Pearlstein on the summit: Columnist sees callousness in Republican lawmakers' approach to health care." They also plugged their own staff editorial and their liberal blogger Ezra Klein. They didn't promote columnist Kevin Huffman trying to compare the health care debate to a Caribbean parrot.